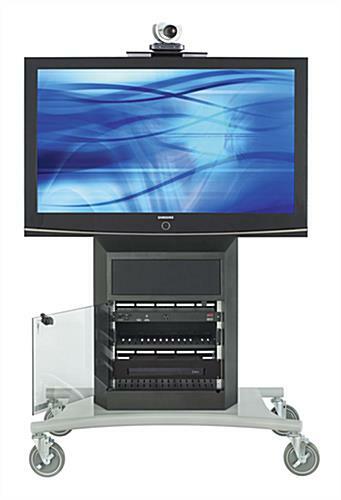 This Monitor Stand with a Locking Glass Door is Modern and Stylish! 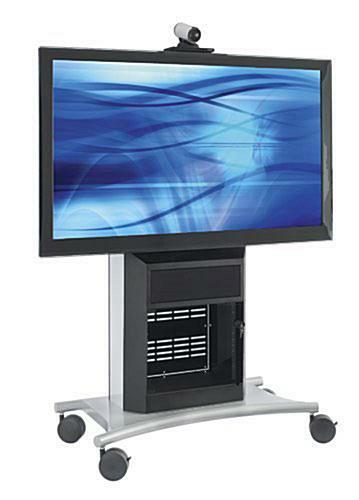 The Fully Functional Multimedia Display System Even Features a Sound System! 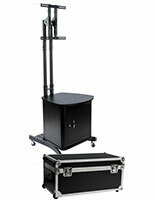 Heavy duty design holds a monitor up to 300 lbs. and 70"
This steel monitor stand that fits a 70" flat screen monitor or television is capable of mounting a video camera, too. The unique design has been optimized for video-conferencing tasks and other multimedia applications. 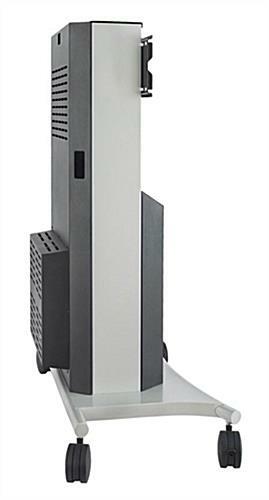 The monitor stand, sometimes referred to as an AV display, has an AmpliVox® integrated speaker system that provides crystal clear audio. 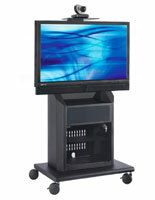 There is also an 8RU (rack unit) cabinet that perfectly houses additional AV equipment and electronics. The monitor stand features a 6-outlet power strip for safely yet quickly plugging in accessories. 45.0" x 62.0" x 24.0"
19.0" x 15.0" x 12.0"